Bedroom Lighting Makeover: the Adventure Begins! Before: the room, au naturel. Don’t get me started on the carpet. We’re on the renovation trail again, with big dreams of fabulous lighting schemes and beautifully smooth ceilings. 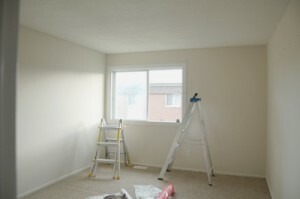 This time we’re tackling the bedroom, with its careless popcorn ceilings and complete lack of light fixtures. Luckily we have Lucy Martin’s great lighting design bible and the Ontario Electrical Code book to guide us, as well as my husband Justin’s many years of hands-on renovation experience. In an ongoing set of projects Justin has jokingly called “Pimp My Condo”, this ceiling reno has a special place in our master plan. Our goal is to get ready to do the floors in tile and hardwood, but before we do that we want to get all of the ceilings taken care of first. It is wise to go from top to bottom when renovating, to avoid damaging everything below – especially new flooring. For example, yours truly has a tendency to drop tools when she gets tired, and gravity works, well, from top to bottom. On outdated parquet, it is regrettable but you can shrug it off. On new hardwood you just spent a fortune on it would be a disaster. This project is also going to provide the foundation for a lot of smaller projects I’m really excited about. For example, there’s a lot of wasted space in the closet, so I want to build some custom organizers, and replace the cheap sliding doors with bifold doors that will allow me to see my full wardrobe at once (a curated wardrobe is a versatile, and therefore smaller wardrobe). There’s also going to be some additional lighting in the closet. I also want to redo the bed – right now we just have mattresses on the floor – not very stylish! A window treatment that’s a little more elegant is also sorely needed. And – very exciting – once my woodworking skills are up to scratch, for the bed I will be making the headboard to end all headboards. So, like I said, lots of big dreams. But as the saying goes the journey of a thousand miles begins with the first step. In the interest of sensible portion control, I have chosen to tackle the following low hanging fruit. 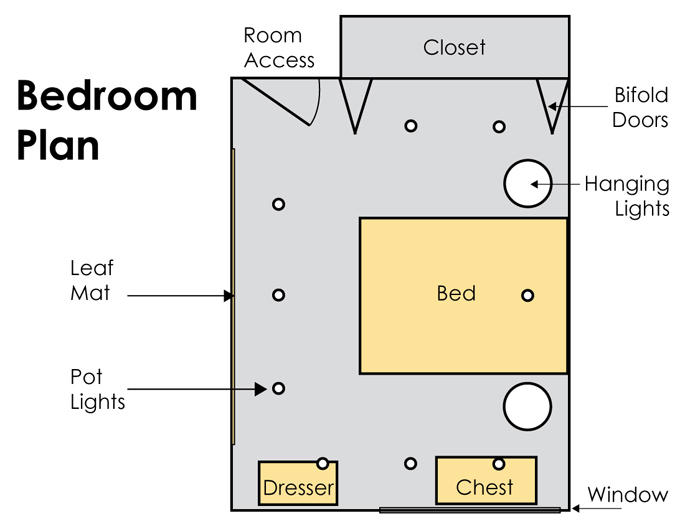 Plan view of our bedroom (to scale) showing the lighting we plan to install. We factored in the bifold doors for the closet to ensure there would be clearance. Scraping off the ghastly popcorn finish and creating a smooth finish on the ceiling. Pot lights (specifically directional spotlights) – and lots of them, to illuminate the walls, visually pushing them back and creating the illusion of a larger space. A couple of them will be aimed at the closet to provide a bit of illumination until we can install the closet lights. One will provide some drama, definition and light to the dresser. Hanging lights beside the bed for reading and general ambient lighting. A fresh new coat of paint on both ceiling and walls. New bed linens to freshen things up. I like my current duvet cover, but the cats grew up with it and it’s all too obviously been the victim of frisky kitten claws. New curtains that will add some flair while still providing two levels of coverage: sheers for daytime privacy and heavy drapes that will provide near-total light blockage for deep sleep. Our initial goal is to spend $2,500.00 or less for everything. The good news is that because we’re doing the labour ourselves, we get to spend all of it on cool stuff, and stuff that makes the cool stuff work. When it comes to renovations, however, I tend to seize the bit in my teeth and feature creep like crazy, so we’ll see what happens. The hanging light fixtures have not been chosen yet, so the odds are against the plucky yet practical expenditure level. 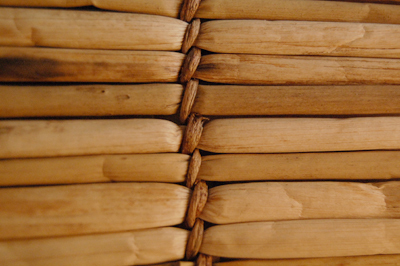 Grass leaf matting from Tanzania. I hunger to be in more in touch with nature, and my style helps me get what I’m missing from my urban existence. While my big dream is to build my own house in the country and look after a bunch of stinky animals and play in the dirt, we’re not prepared to spend 4 hours a day sitting in a car commuting to work to make that happen. But to get just a little bit of what I’m dreaming of, the theme for the decor is “meadow grasses”. It’s simple, reflective of the local landscape, unpretentious (especially in a shoebox-sized condo townhouse), and not too expensive to do. In our living room renovation, the autumnal take on this theme gave me the license to use some stronger colour, particularly orange, which I adore. There is a lot more light coming in the upstairs windows, however, and I think a paler, airier, more zen approach is called for here. While the whole house is an oasis for me, the downstairs will be more sheltered, and the upstairs will be about escape and dreaming. There will be some unifying elements to tie the upstairs and the downstairs together, but having two floors means you can separate things a bit without creating a house with multiple personality disorder. Before, with furnishings and decor. The layout and grass mats are working for me, but not much else in this view is. Grass matting on the walls. I bought these in Tanzania for next to nothing, and they provide amazing texture and depth to plain old drywall walls. The layout of the room is practical and symmetrical (but not too symmetrical). I’ve tried moving the furniture around dozens of times, but I always comes back to this layout because it just works so well traffic-wise. The bed is central but easy to get around if you just want to get something from the closet or dresser, or want to close the window because of a downpour. Snazzy storage courtesy handmade wooden chest and boxes, again from travels in Tanzania. The cushions on the bed, all gifts from my Mom. Three is my limit – I cannot do the quicksand pit of perpetual extra cushions. You just have to move them around twice a day anyways. 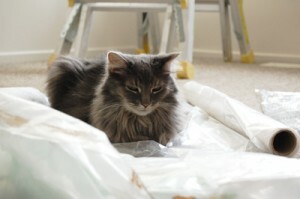 Cats love to supervise, but rest assured that Angus was shooed out of the room before the drywall dust and insulation started flying. The dark curtains shut out the light in an afternoon nap-friendly way, but together the dark curtains and the dark chest create this weird black hole effect in one corner of the room that isn’t balanced with anything else. The mismatched bedside lamps. It’s not their fault – they matched when I bought them. Their tripod bases are not as stable as they could be, however, and I knocked one over one day while vacuuming. While I am giving myself frugality points for rewiring the broken one (for regular incandescent light bulbs) and adding an old lampshade so I wouldn’t have to buy a new lamp, that’s the only positive thing that can be said about that. Truth be told, in such a small room I resent anything that touches the floor, including floor lamp stands. Hence the hanging pendant lights in our plan. The end of Canada Day weekend or bust! That’s right folks, there’s one calendar month until July 1st and then we’re moving back in to our bedroom. This is a blistering pace for us – our living room renovation took almost 18 months. We’ve got a week of intense demolition and wiring work under our belts (see the next post for that story) so we’re in with a chance. Bedroom Lighting Makeover Part 2: To the Vapour Barrier…and Beyond! Let There Be Light! Part 7: Taa-Daaa!